Morion announces the release of a new series of ultra low short term stability and phase noise oven controlled crystal oscillators (OCXO). The MV272M is the first of this series, with Allan deviation of less than 3×10-13 and phase noise of -145 dBc/Hz @ 10 Hz offset & -160 dBc/Hz at 1 kHz offset frequencies. 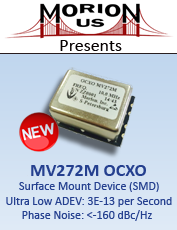 The MV289M is the second in Morion’s series of ultra low short term stability and phase noise oven controlled crystal oscillators offering Allan deviation of less than 1×10-13. Phase noise is -125 dBc/Hz @ 1 Hz offset & -160 dBc/Hz at 1 kHz offset frequencies. Both stability and close-in phase noise performance are the best available. 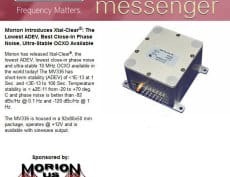 The MV314 is the third in Morion’s series of ultra low short term stability and phase noise oven controlled crystal oscillators (OCXO) with Allan deviation of less than 2×10-13. Phase noise is -146 dBc/Hz @ 10 Hz offset & -160 dBc/Hz at 1 kHz offset frequencies. 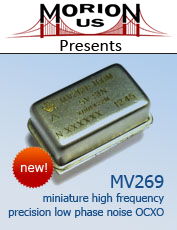 The MV289M is available in frequencies 5 MHz to 10 MHz and is housed in a low profile 50x50x16 mm package. A standard Oven Alarm & Oscillation ON/OFF function is provided. Data sheet coming soon. Morion US, LLC is scheduled to launch it's website by November 2014. 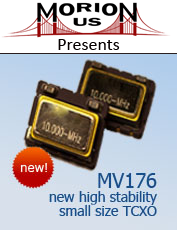 Morion US, LLC has just introduced MV44, Voltage Controlled Crystal Oscillator, 4-67.0 MHz. On 1st – 4th December 2014 Morion, Inc. takes part in PTTI 2014, which takes place in Boston, Mass. You are welcome to view new products of our company at our booth #102. Official web-site of PTTI 2014 – http://www.ion.org/ptti/. On 11th – 14th November 2014 Morion, Inc. takes part in Electronica 2014, which takes place in München, Germany. You are welcome to view new products of our company at our booth #B6.456. Official web-site of Electronica 2014 – http://www.electronica.de/.